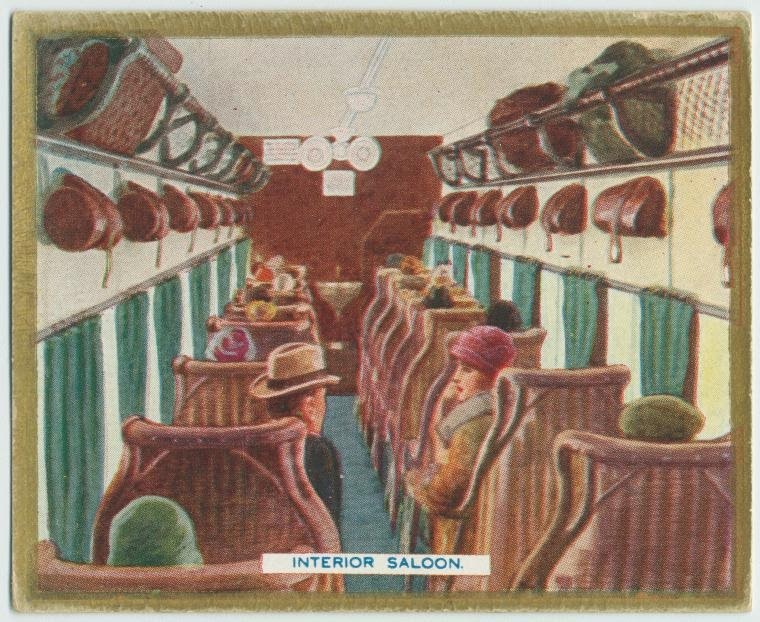 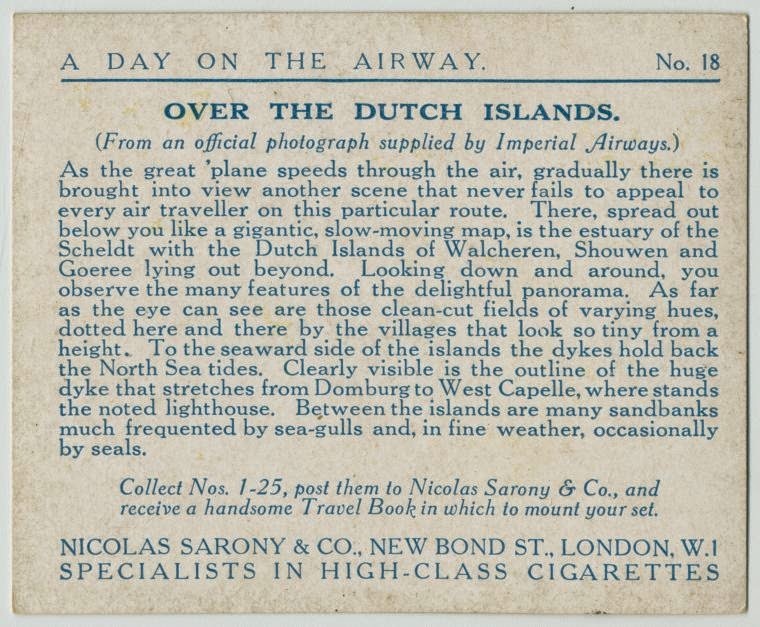 A terrific set of cigarette cards depicting a flight from London to Amsterdam in the early days of commercial air travel. 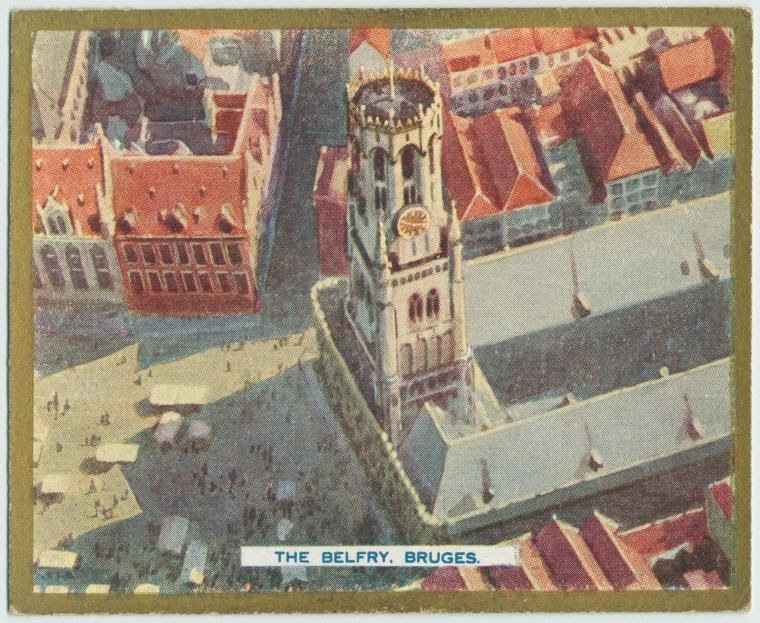 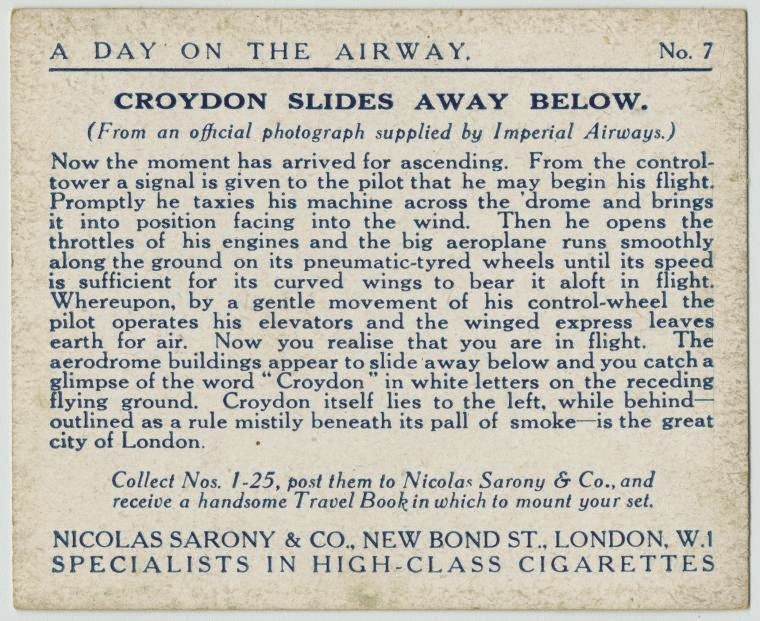 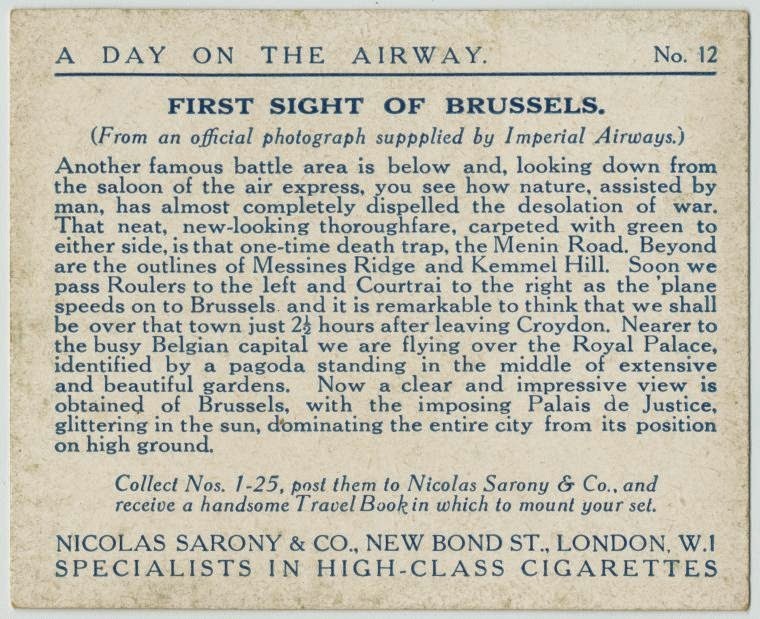 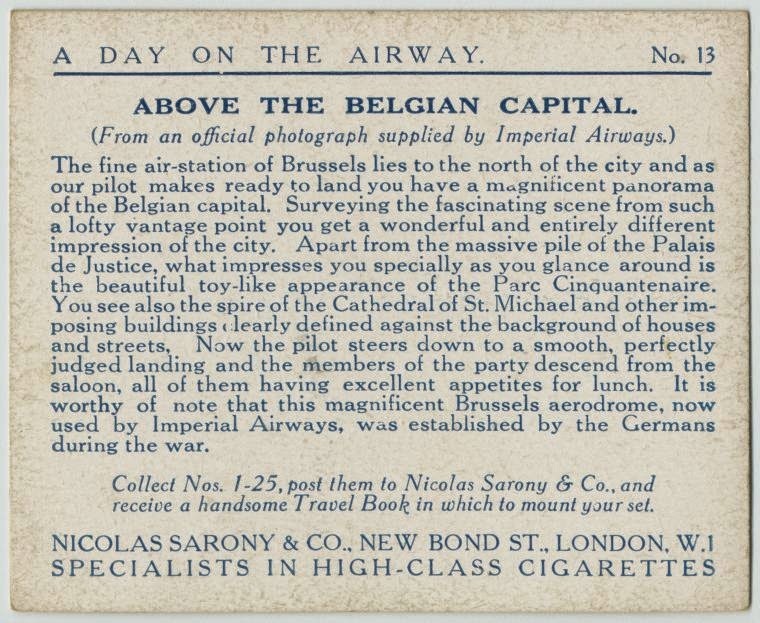 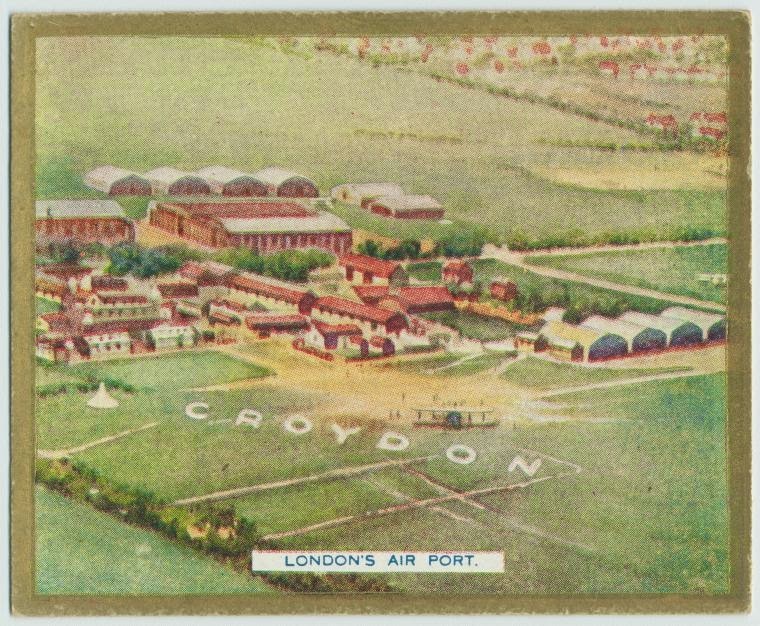 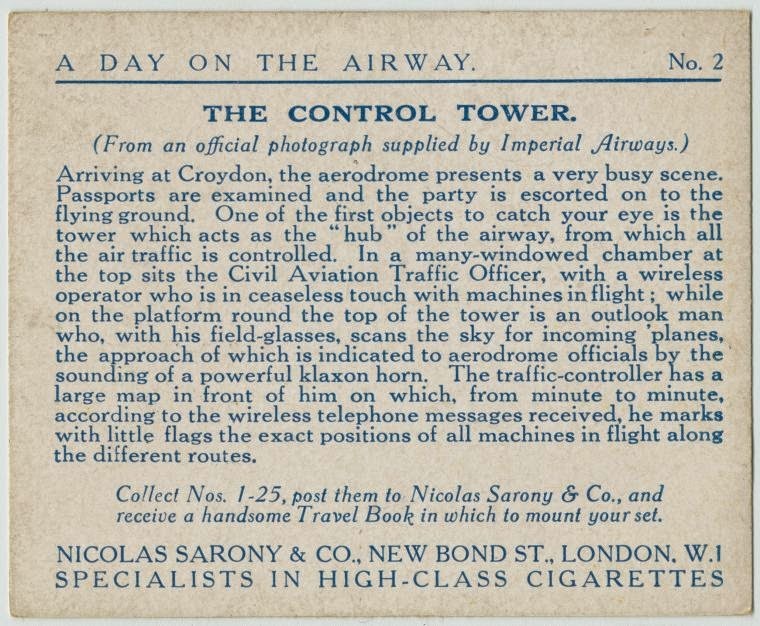 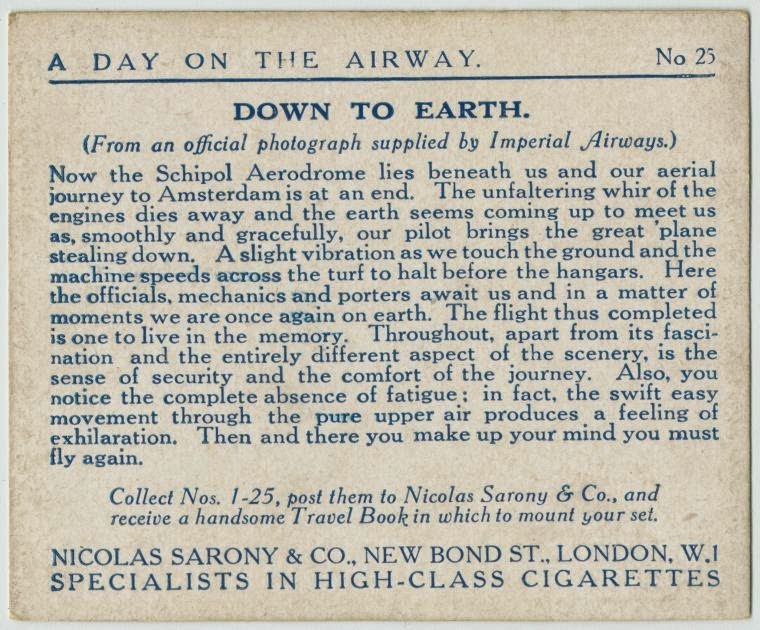 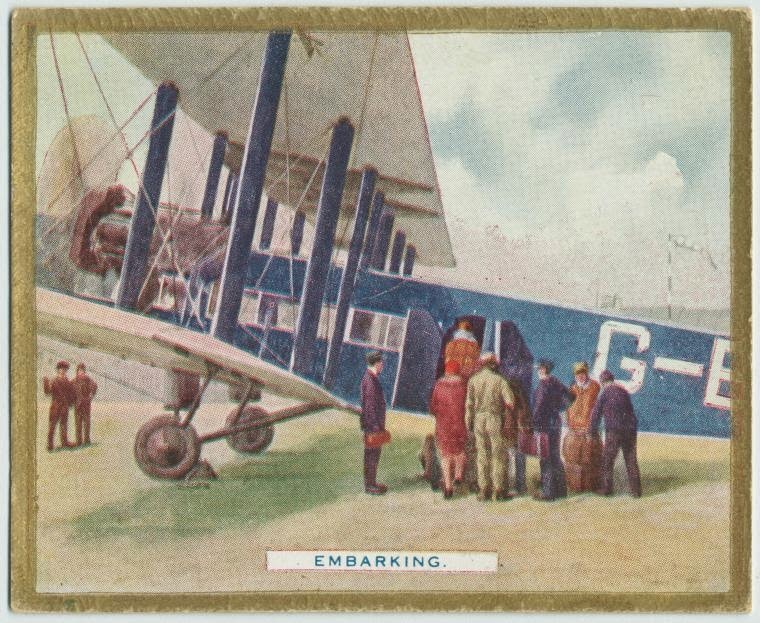 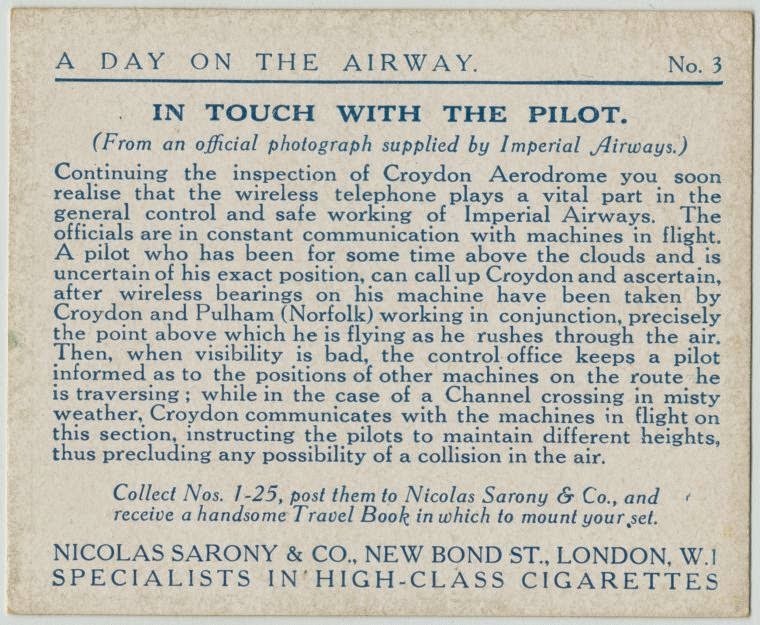 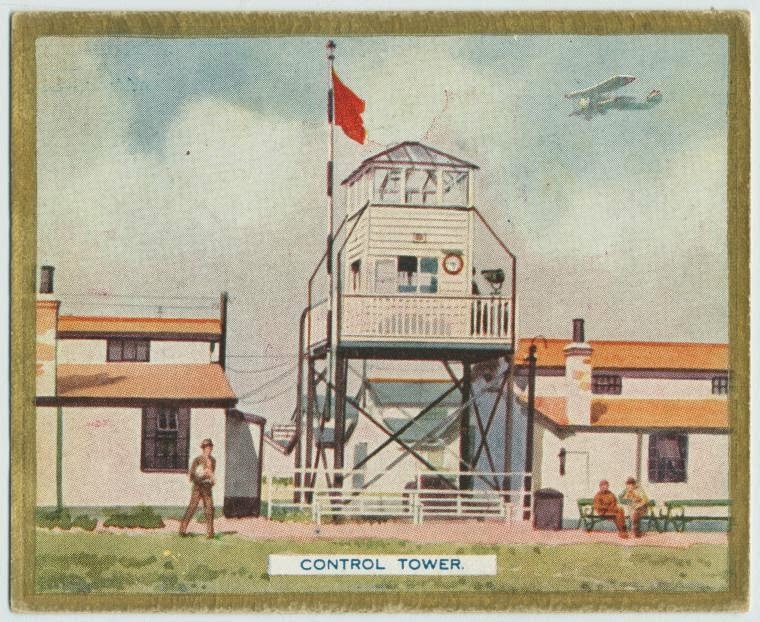 The images (each "from an official photograph supplied by Imperial Airways") are accompanied by text detailing "our" flight, from check-in and take-off, to views over the Channel, France, and Brussels (where we land for lunch), to the final landing in Amsterdam. 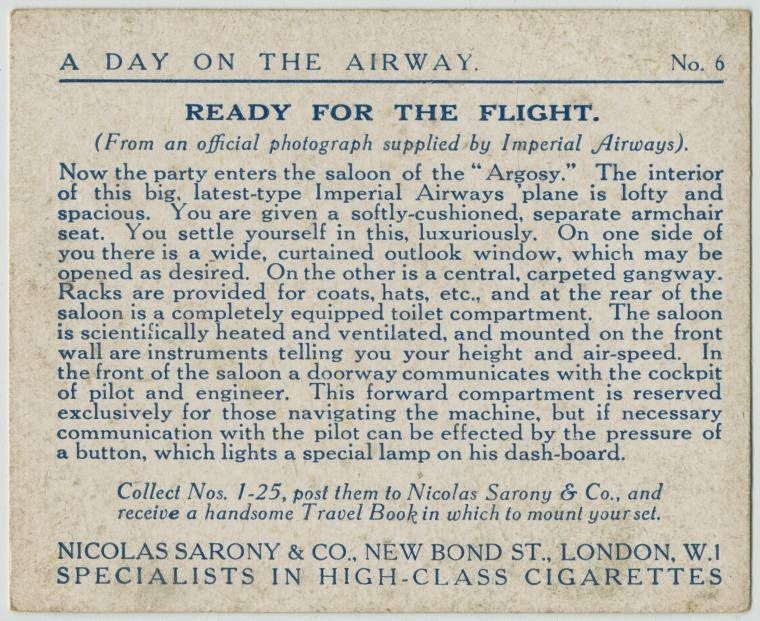 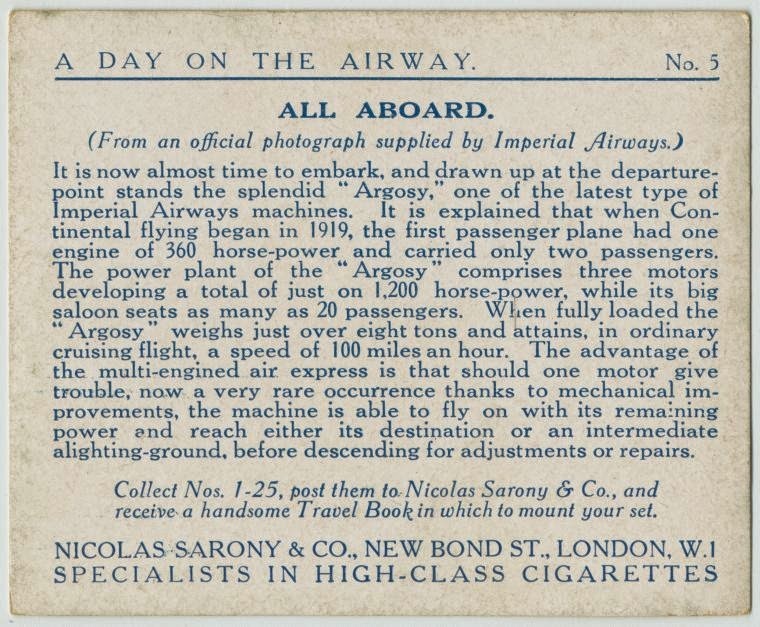 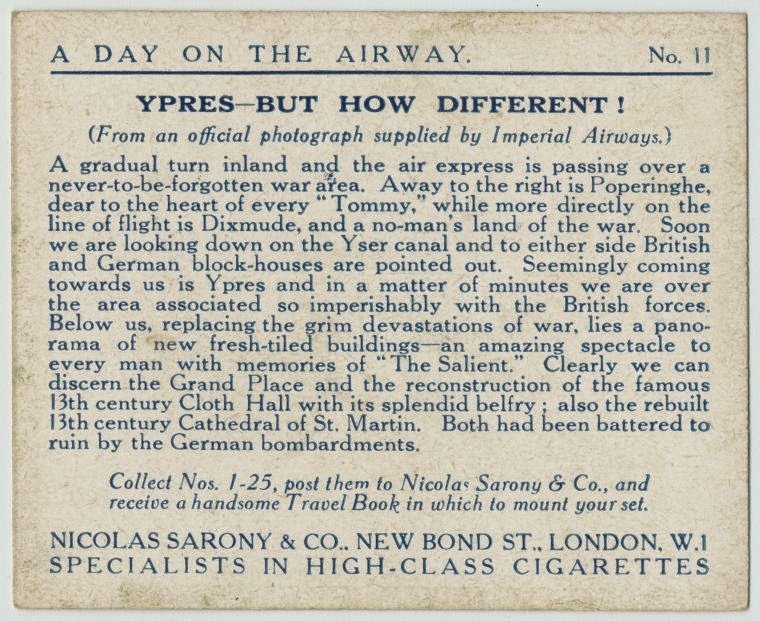 I've included the backs with the text, as the little details are fascinating insights into a time when planes held "as many as" 20 passengers, reached cruising altitudes of 3,000 feet, and got from London to Brussels in "only" two and a half hours. 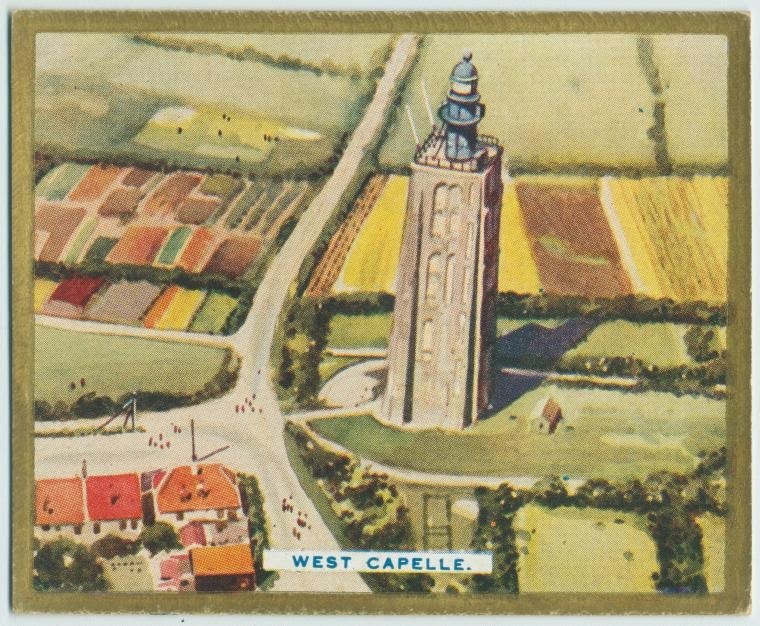 Note: For space, I've only included about half the aerial views. 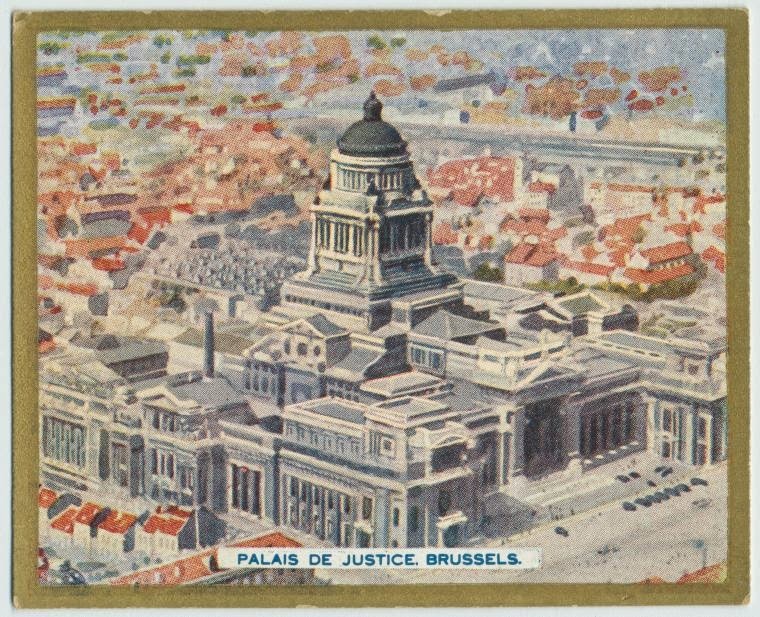 The complete set is here. 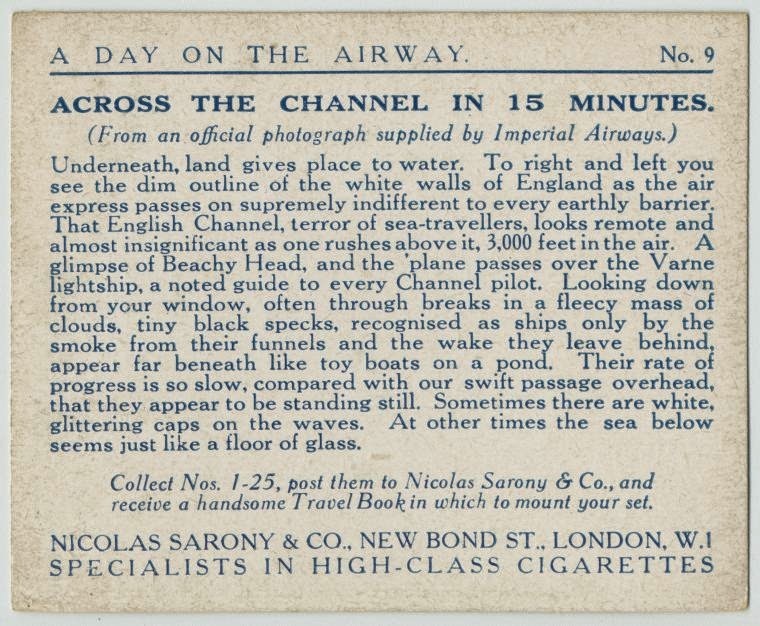 These are brilliant! 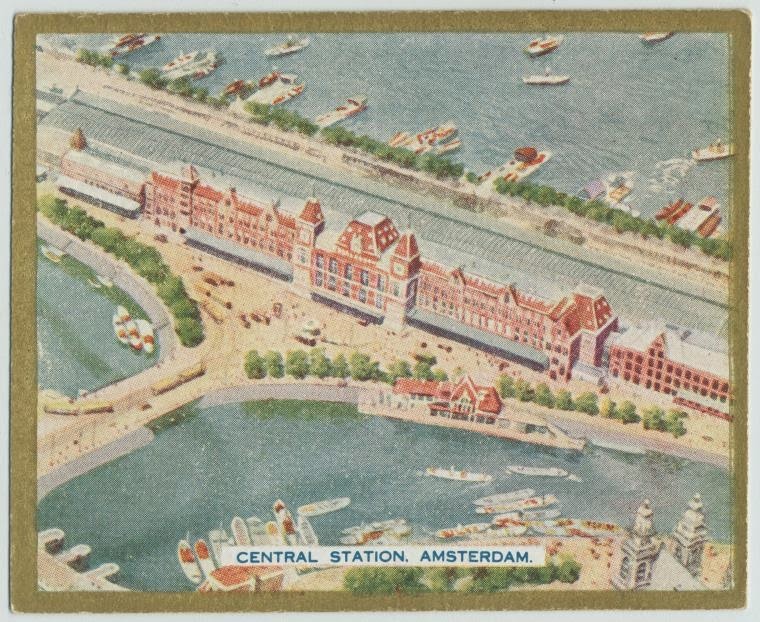 Living in the Netherlands myself, I recognize many of the buildings shown and mentioned although the over-all effect wouldn't be quite as picturesque today. 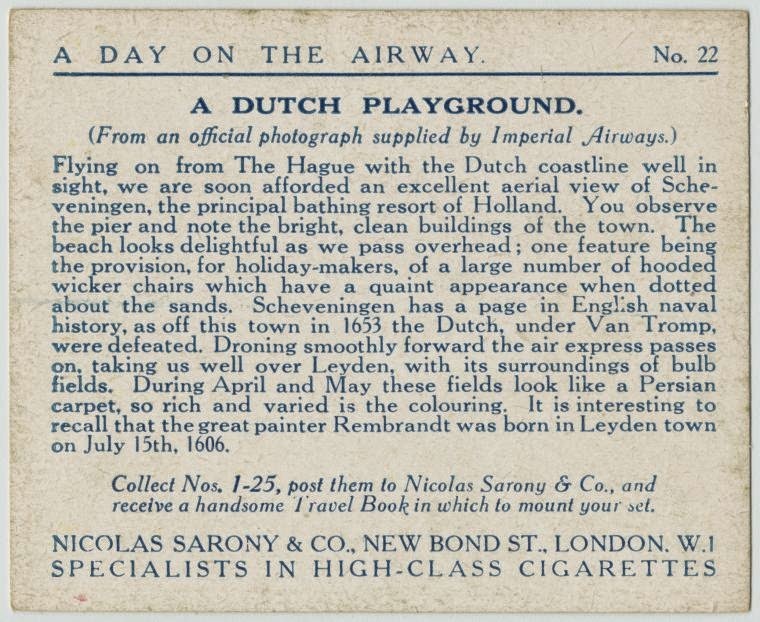 The chauvinistic take on history is a bit funny as well. 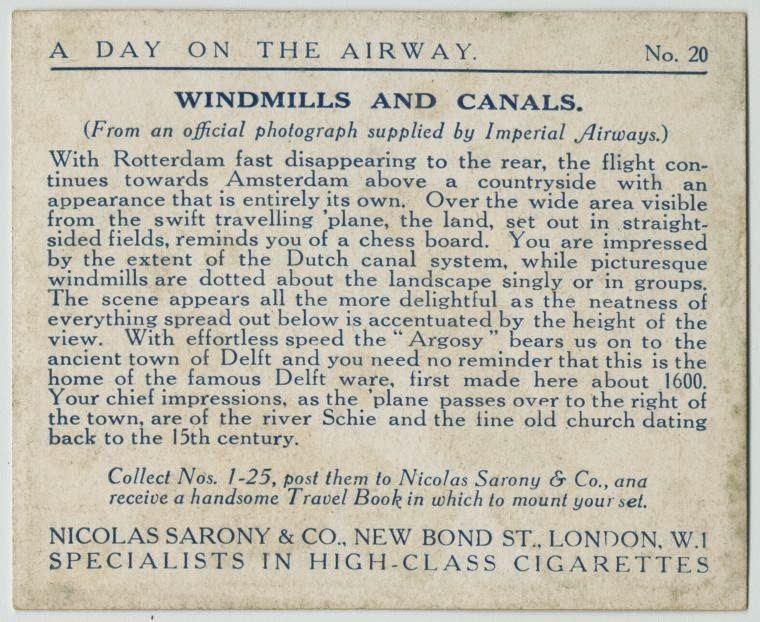 I was wondering about one thing though: Why didn't Imperial Airlines take a direct route to Amsterdam? 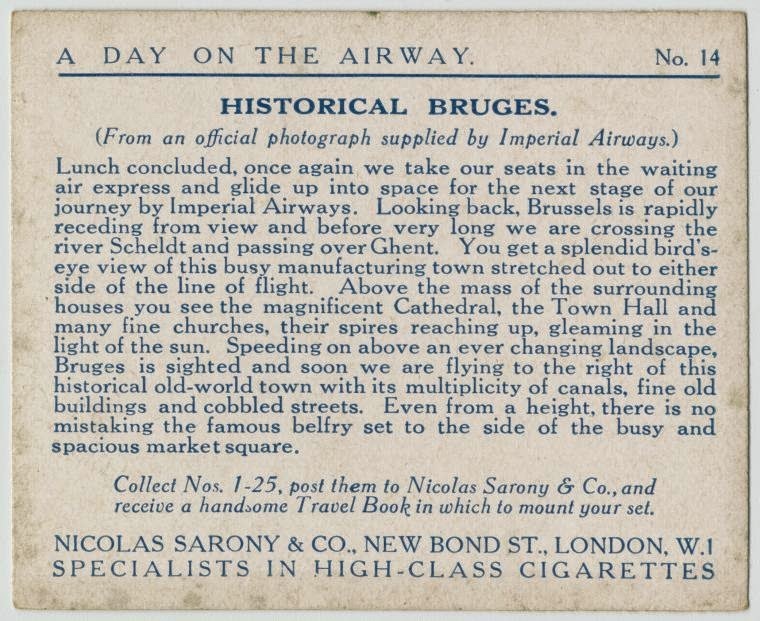 It would only be a bit further than London to Brussels so I guess it should be possible to do so (especially because there were also trans-Atlantic flights at this time). 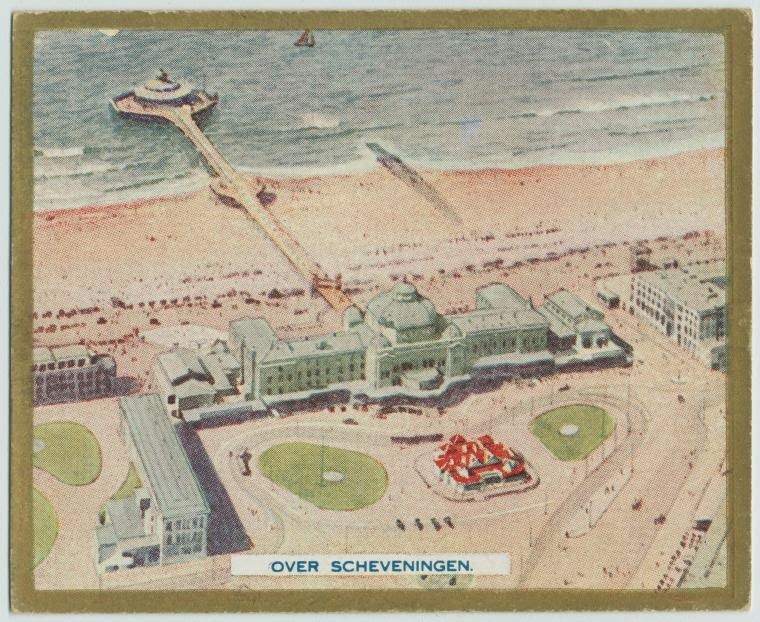 Is this a bit of a tourist route or might it be a safety consideration (spending less time over sea)? 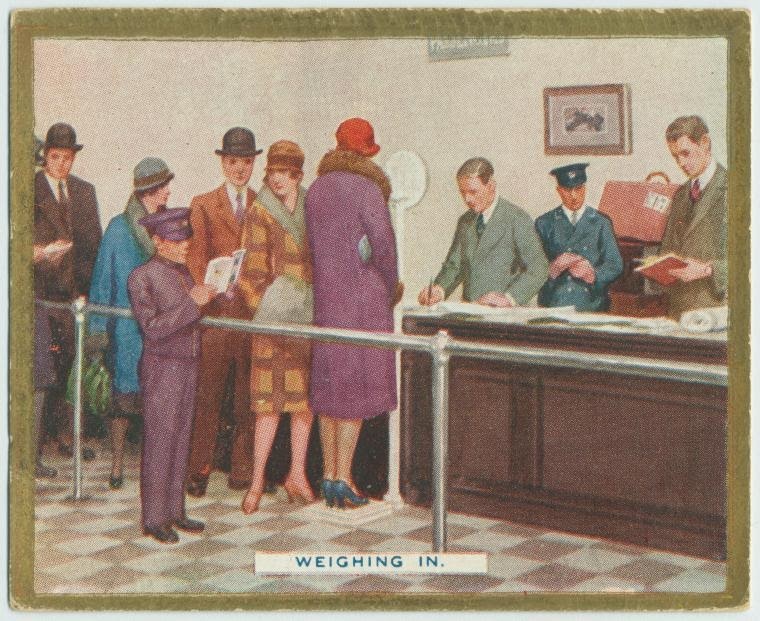 I enjoyed seeing everyone get weighed in. 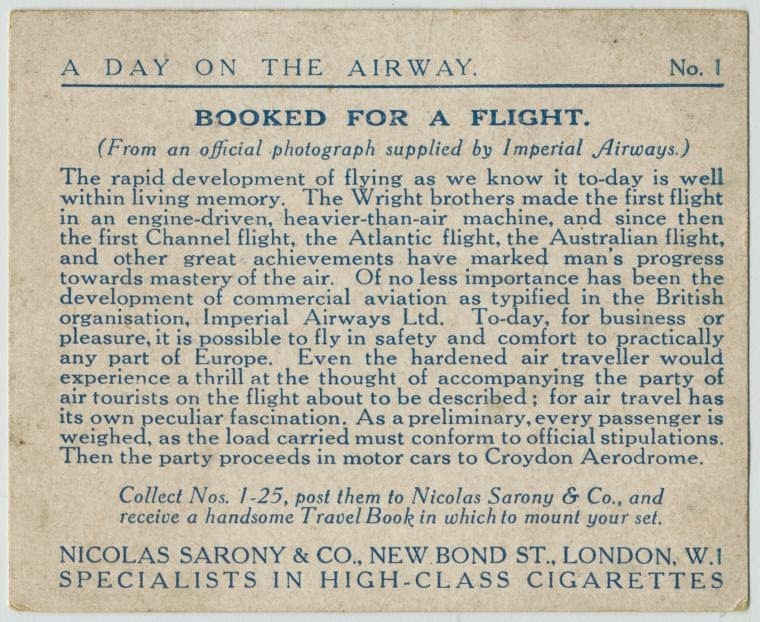 Will the airlines resort to this again to make some extra money? 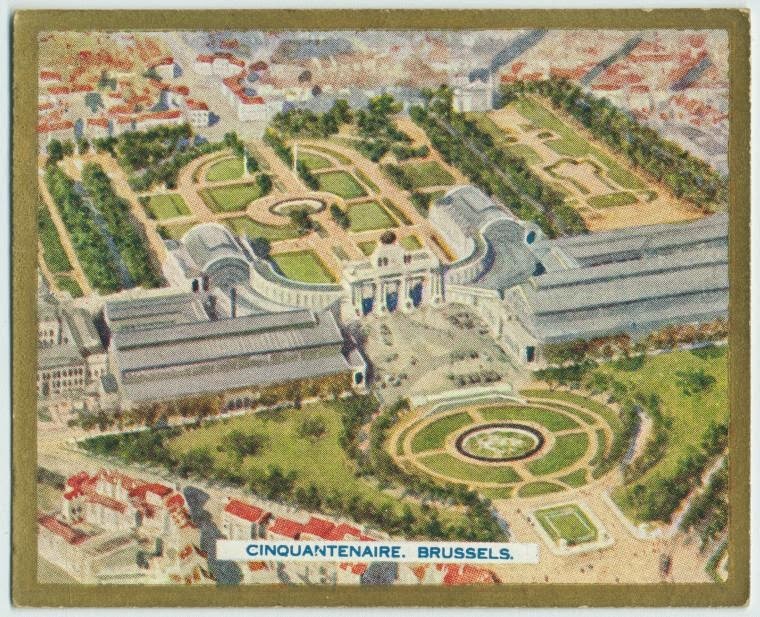 Lauriana--how especially wonderful that you know the area! 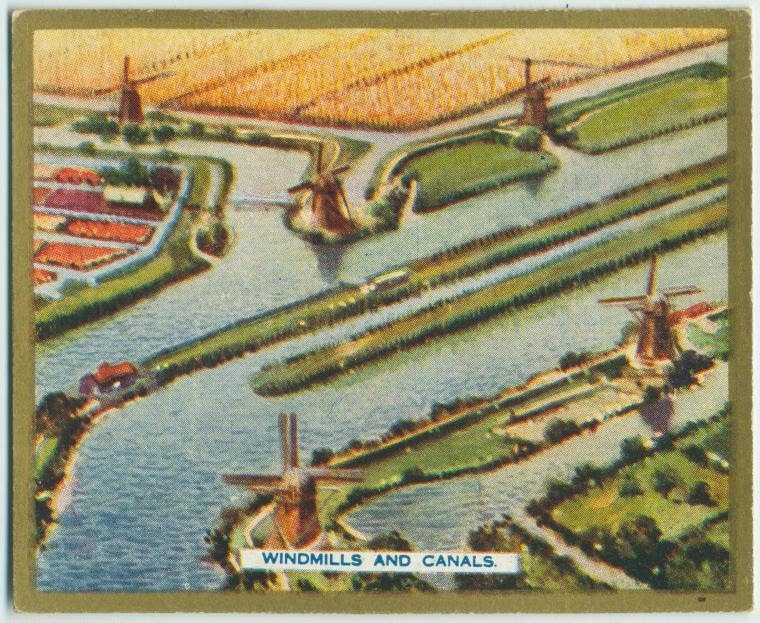 I don't know exactly why they would take the more meandering route; my guess is that it's a bit of both. 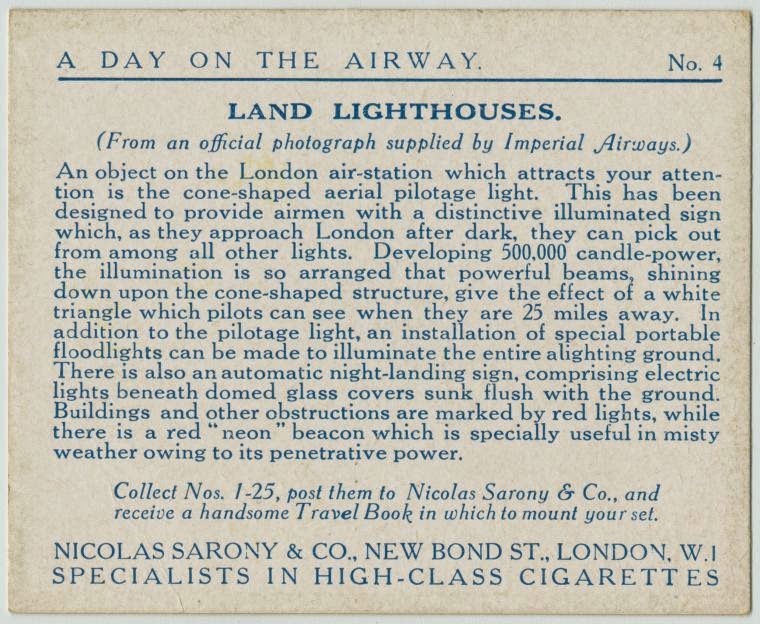 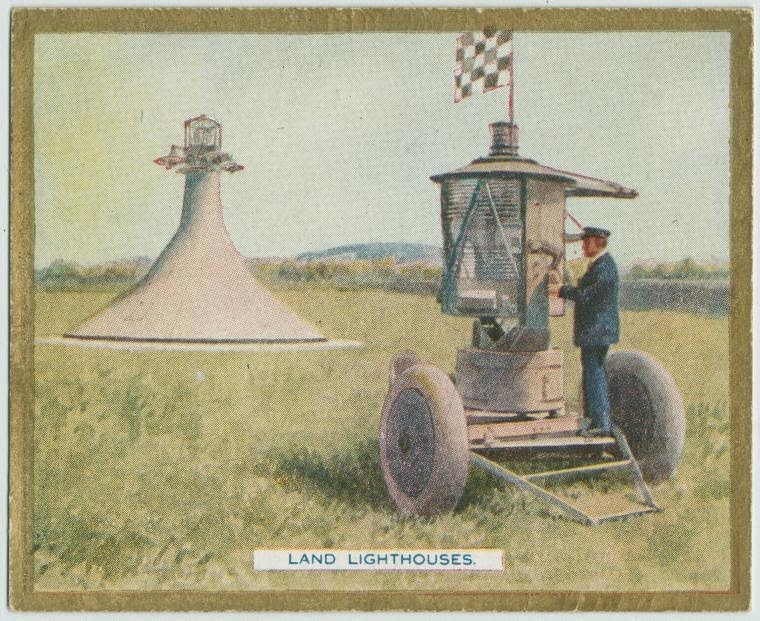 They were still trying to sell the idea of flying to the public, and the cards' emphasis on the views you get suggest exploitation of the sightseeing angle. 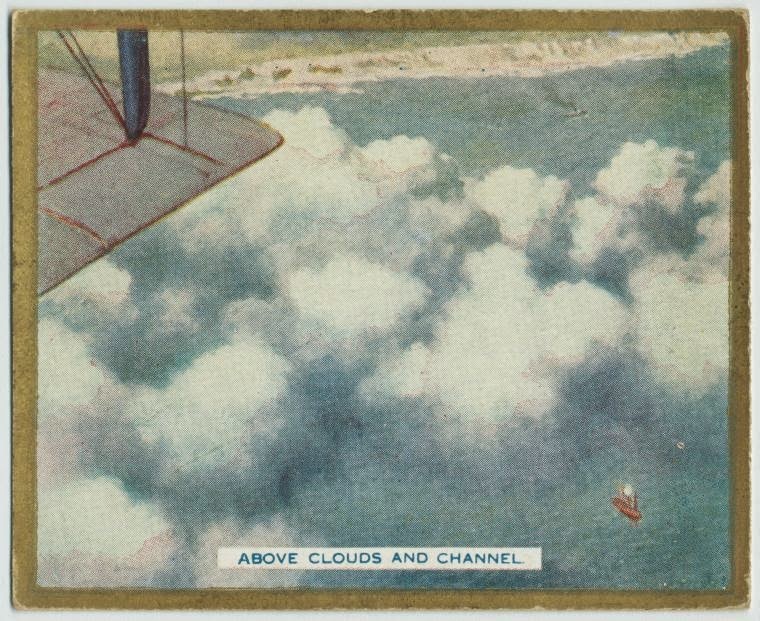 The scenic route might be a part of that. 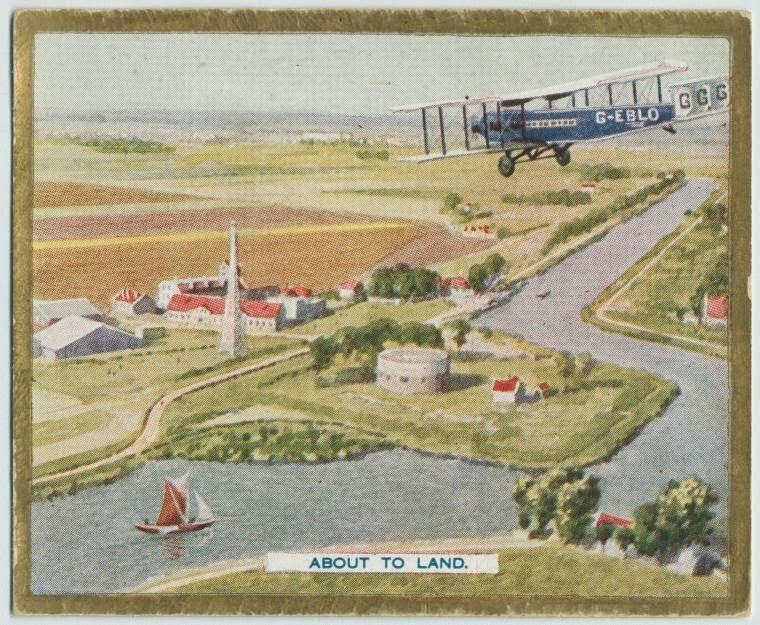 At the same time planes were still quite unreliable and forced landings were common, so reducing the amount of time over water could very well be a safety consideration. 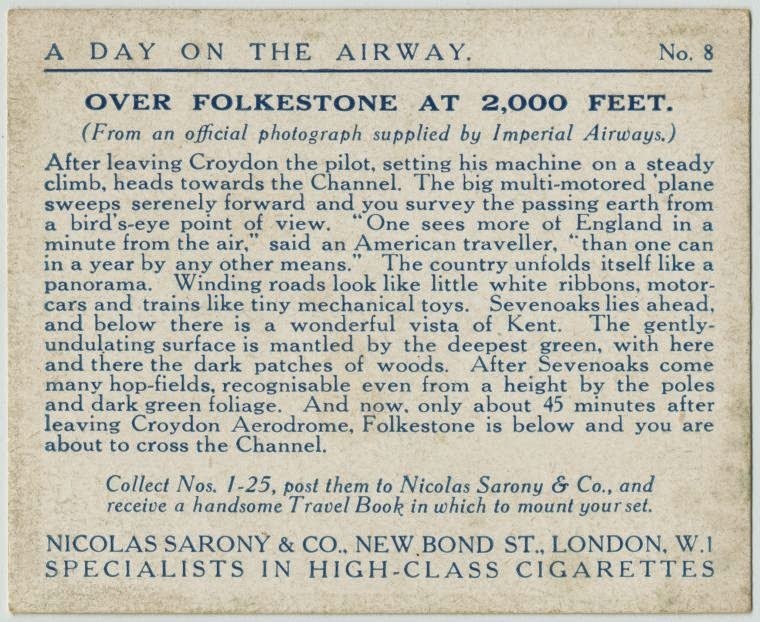 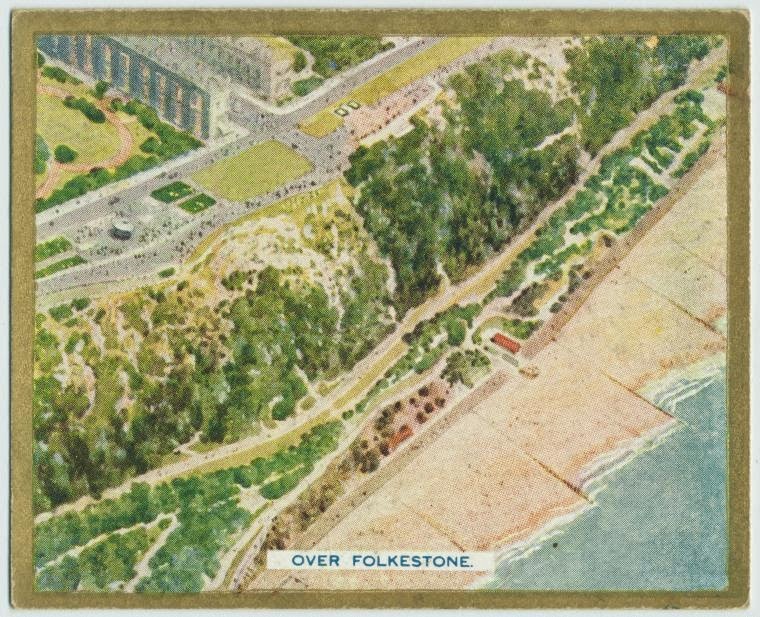 The plane crosses between Folkestone and Calais (though I didn't include the Calais card), where the Channel is thinnest. 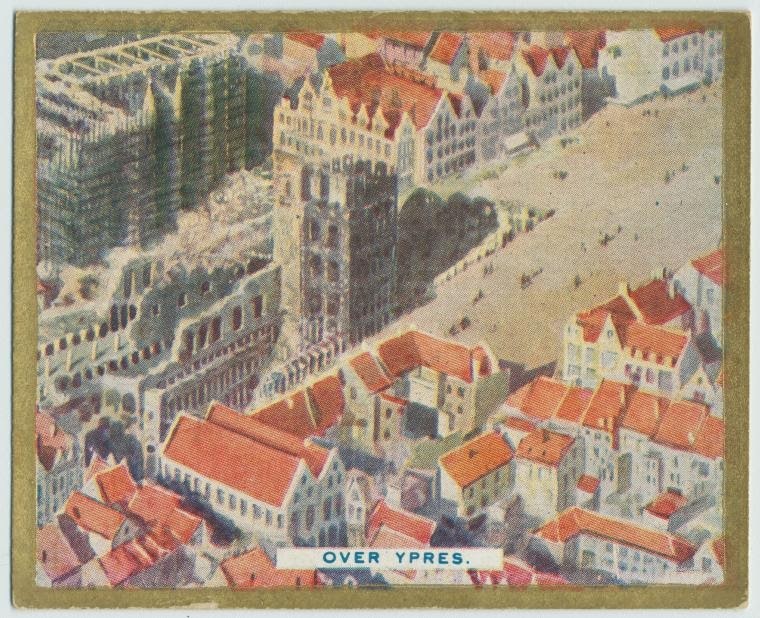 Going over Ypres and Brussels though seems to be just for fun--Google maps gives me a driving route from Calais to Amsterdam that goes nowhere near them, but of course stays on land. 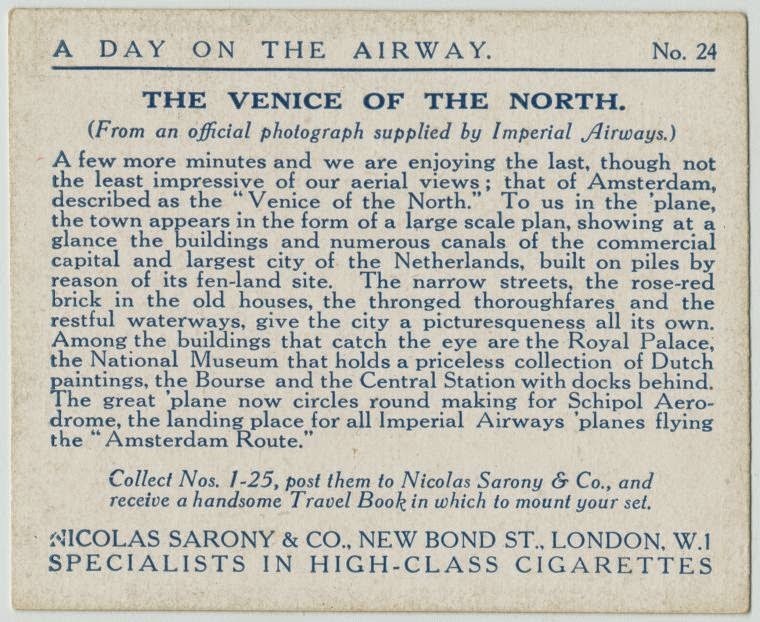 I wonder if this kind of sightseeing route was common at the time. 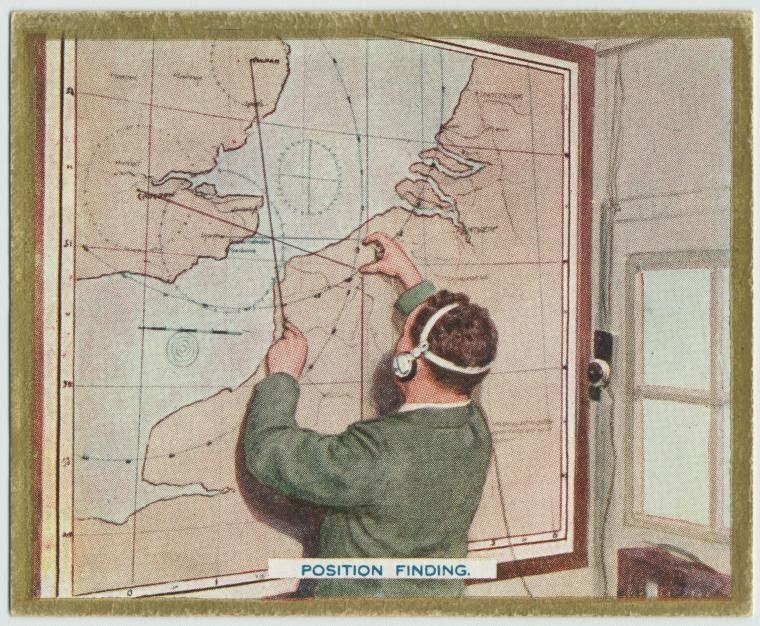 If I find a good source of information I'll let you know!